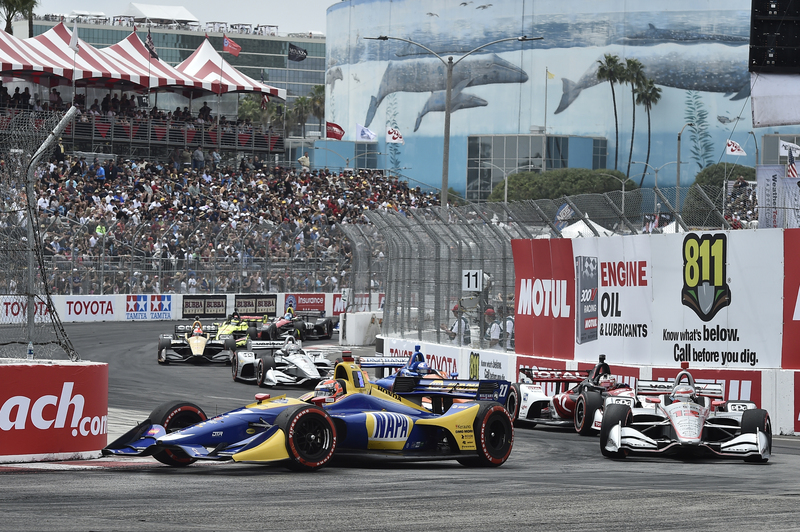 The 44th Toyota Grand Prix of Long Beach saw the 2018 IndyCar season’s third winner in three races as Alexander Rossi took the checkered flag from pole position. Yesterday’s Verizon P1 Award Winner checked out from the beginning of the race and never looked back despite challengers like Will Power, Sebastien Bourdais, and Scott Dixon trying to pace his No. 27 Honda machine at versions points in the race. Will Power would finish P2 after starting alongside Rossi on the front row. Ed Jones matched strategy with superb driving to put his No. 10 Chip Ganassi Racing machine on the podium. Rookie Zach Veach finished 4th in what has to be considered a win for his No. 26 Andretti Autosport team. Graham Rahal wrapped up a hard fought 5th place finish to round out the top 5. Marco Andretti, Josef Newgarden, Tony Kanaan, 2017 winner James Hinchcliffe, and Charlie Kimball completed the top 10. For Rossi, the win secures his position at the top of the points standings with a total of 126 through 3 rounds. Josef Newgarden finishes the weekend second in the standings with 104 points after his 7th place finish. Graham Rahal makes a move to 3rd in the points with his top 5 in Long Beach. Simon Pagenaud brought out the yellow flag on lap 1 in Turn 1 after the No. 15 or Graham Rahal made contact with Pagenaud’s No. 22. Pagenaud spun into the outside wall at corner entry, causing a left rear puncture. It was day done for Pagenaud. Josef Newgarden was the first of the front runners to pit on lap 16. Leader Alexander Rossi hit the pits on lap 25 for black-sidewalled primary Firestone tires. This turned the lead over to Will Power, briefly, before Power pit on lap 30. Scott Dixon was able to jump Will Power in the pits on that same lap, moving up 2nd. This handed the lead to Ryan Hunter-Reay temporarily, before he pit for Firestone blacks on lap 31. After the first round of stops, Rossi led from Dixon and Newgarden, whose early stop appeared to have paid off. Newgarden pitted again on lap 39 for the Firestone option tires, appearing content with attempting another undercut on the leaders. On Lap 42, Kyle Kaiser brought out the second full course yellow of the day as he stalled his No. 32 car after running into the run off area of Turn 1. The leaders opted to stay on track instead of pitting. After the restart, Sebastien Bourdais made what was the move of the race and maybe the season so far as he overtook both Scott Dixon and backmarker Mattheus Leist into Turn 1 with an over/under maneuver. Alexander Rossi would make his final pit stop on lap 65 with a comfortable lead over Bourdais and Dixon. His Honda powered No. 27 machine had checked out from pole position up to this point. The yellow flag would fly again as Zachary Claman De Melo contacted the wall and stopped at the exit of Turn 7. The yellow would benefit Will Power immensely as he had pitted on the same lap as the yellow flag, but just before it flew. Scott Dixon pitted under yellow, incurring a penalty and thus handing second position to Power with 17 laps to go. The yellow flag would come out again as Sebastien Bourdais, Robert Wickens, and Ryan Hunter-Reay collided at the hairpin of Turn 11. Bourdais would rejoin quickly after the yellow came out. Wickens and Hunter-Reay rejoined as well. With 9 to go, Rossi led the field to green and held on for the win in Long Beach. “This one, even though it’s not my true home race, it really feels like one,” said Rossi, whose Nevada City, California, home is closer to Sonoma Raceway, site of the season finale. The Verizon IndyCar series returns to action on April 22nd with the Honda Indy Grand Prix of Alabama. Open-Wheels will provide coverage beginning on Friday with practice sessions.